House projects don’t always go smoothly. 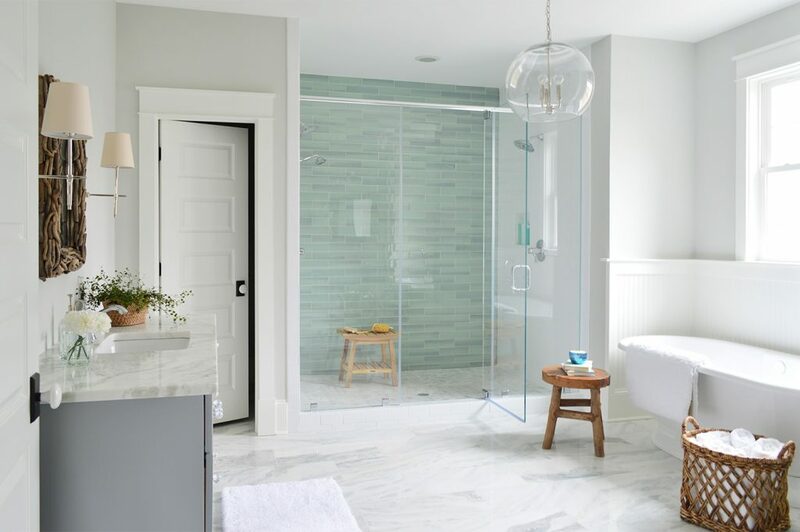 We’ve all been there (heck, we’re there right now with the duplex renovation) so we’re sharing some new strategies that we’ve been relying on to keep our spirits up whenever a renovation feels overwhelming, gets delayed, or hits some other unexpected snag. 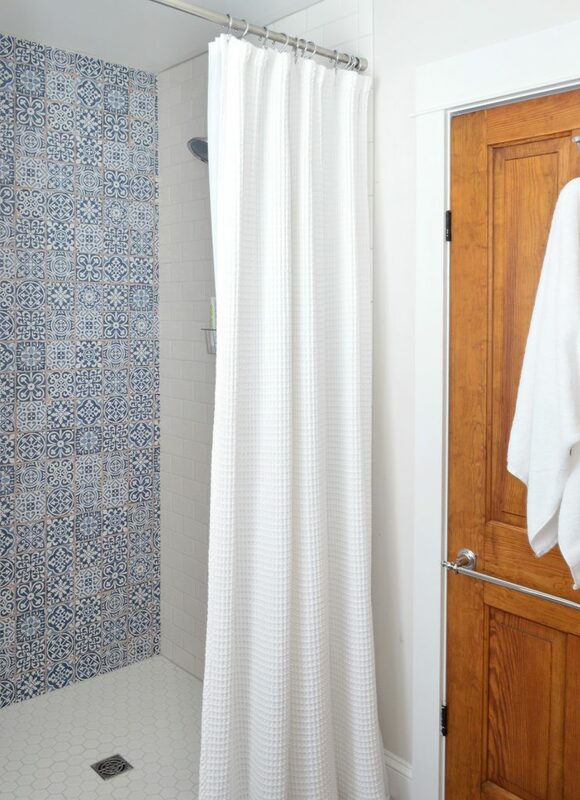 We’re also discussing some upcoming bathroom trends (one of them shook Sherry to her very core). Plus we’re officially starting our no TV challenge. If you missed the first few mentions of our fridge delivery drama, you can hear the initial story in Episode #126 and the discovery of the dented door in Episode #127. 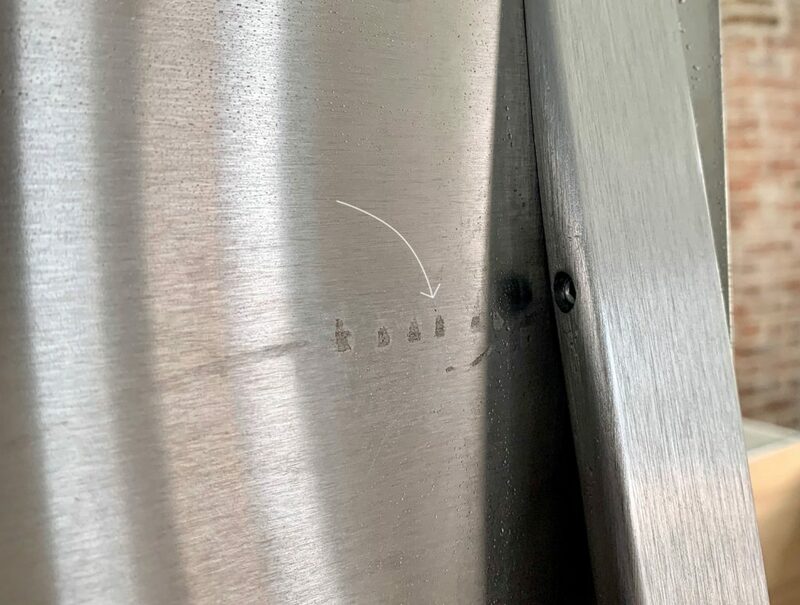 Below is the photo of the “scrape” the second delivery guy discovered on the other fridge during our most recent trip (don’t mind the tiny water droplets on the door, Sherry was in the midst of desperately trying to wipe the entire issue away). See how convincing/terrifying it was? Especially because it was lined up with the handle screw, totally validating the delivery guy’s theory that a drill had scraped the finish off. And below you can see a sneak peek of the counters that we (finally) got installed. 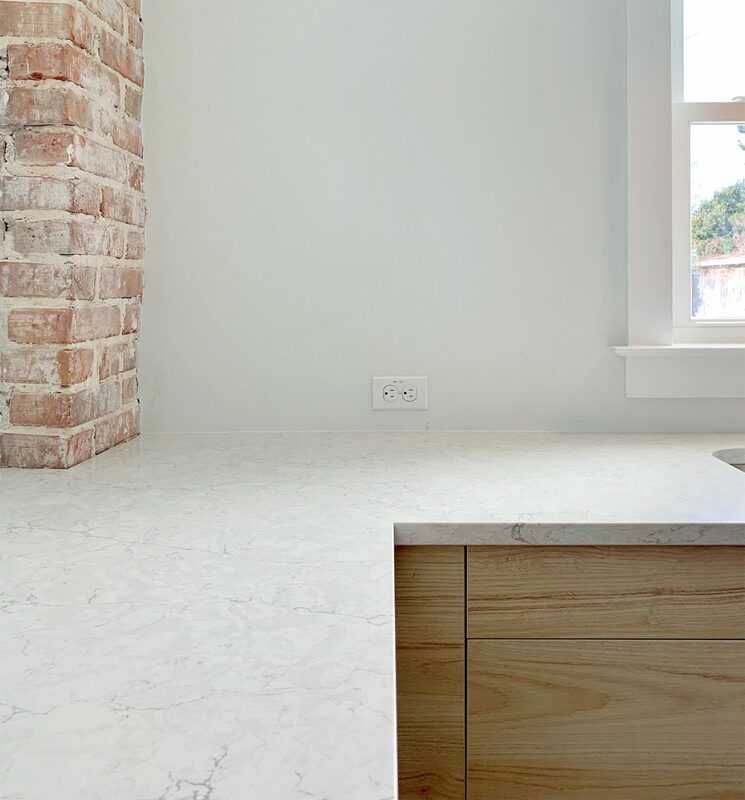 They’re the same Silestone quartz in Pearl Jasmine that we used on the island in our beach house. Can’t wait to share wider shots of each kitchen when we get them a little more settled (aka: blog post coming soon). We went into more detail in last week’s email newsletter about why we chose these counters (3 times, no less!) so be sure to subscribe here if you want to receive updates and sneak peeks like this in the future. It’s basically a bonus blog post that goes right to your inbox each week. Also, if you missed last week’s episode with the passing mention of our no TV challenge, you can hear it during our interview with Joshua Becker. 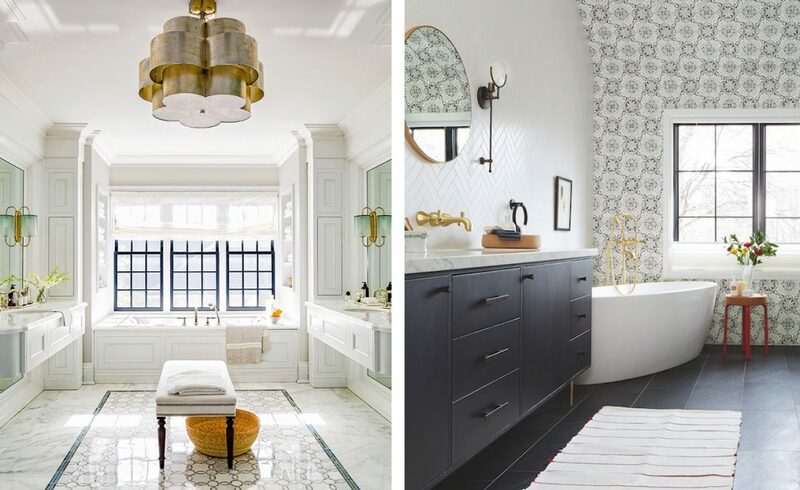 Here’s the full list of House & Home’s 10 Bathroom Trends You’ll See Everywhere In 2019. And here’s the 2018 & 2017 list. Above are their examples of “buttery brass” finishes and the “off-kilter tub” that wasn’t as bad as it sounded to Sherry. 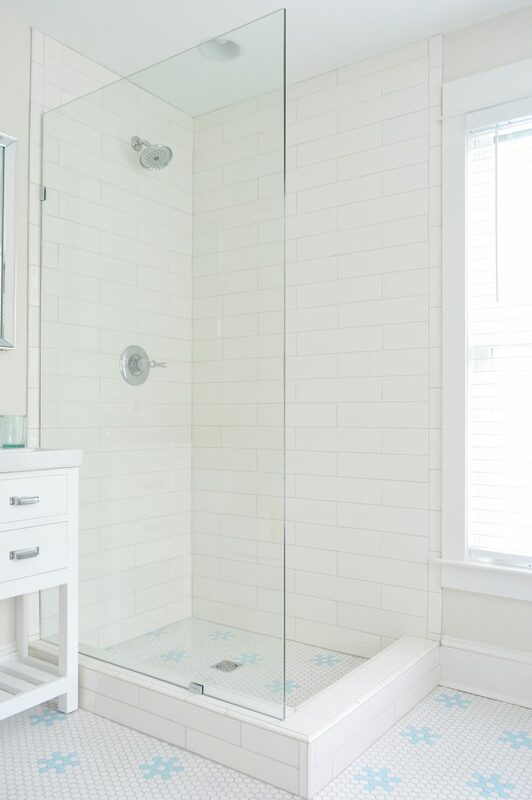 And in the master shower at the beach house, we’ve got an example of an “invisible” shower wall, since the glass pane we used doesn’t have any metal framing (and the consistent floor helps the shower blend in with the rest of the room). Lastly, we talked about the “statement mirrors” we bought to use in some bathrooms at the duplex (the powder rooms, to be precise). They’re out of stock right now, but they’re huge and really nice looking. Hope they’re back soon. If you want to hear more suggestions for fighting project fatigue, lifting your spirits, or celebrating renovation milestones – you can hear more on the subject in Episode #90. 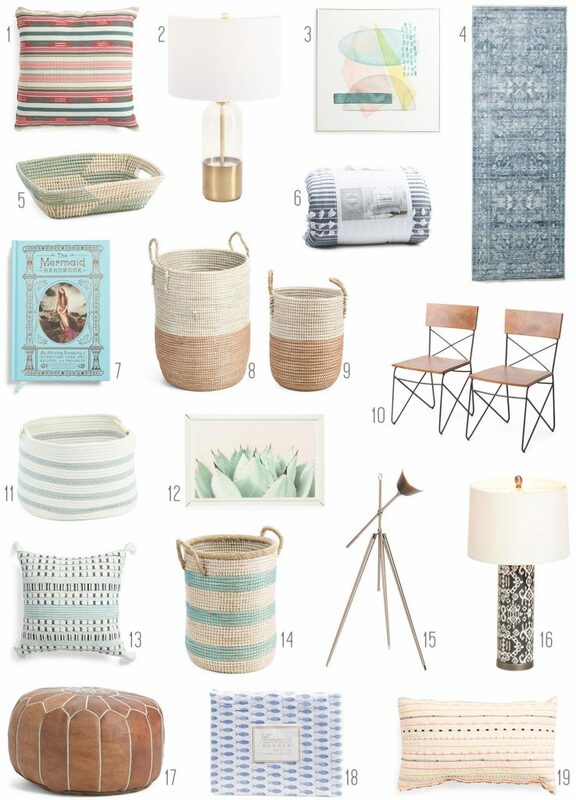 If you want to shop HomeGoods online, you actually have to go to the “Home” section of the TJMaxx website here. And here’s the outdoor smart plug ($29) I bought for the patio lights on our back porch. It was easy to set-up and even has two separate plugs that you can control separately. I should’ve mentioned in the episode that if you’re going to plug that in outdoors, you probably want to install a weatherproof “in-use” cover to your outlet like I did (this one works well). It will protect your outlet while allowing you to keep the smart plug plugged in 24/7. And here are some posts where you can read more about our favorite smart tech and how we use it, plus the dusk to dawn timers and sensors we use (you know, now that I’ve clarified my love of smart tech AND timers). 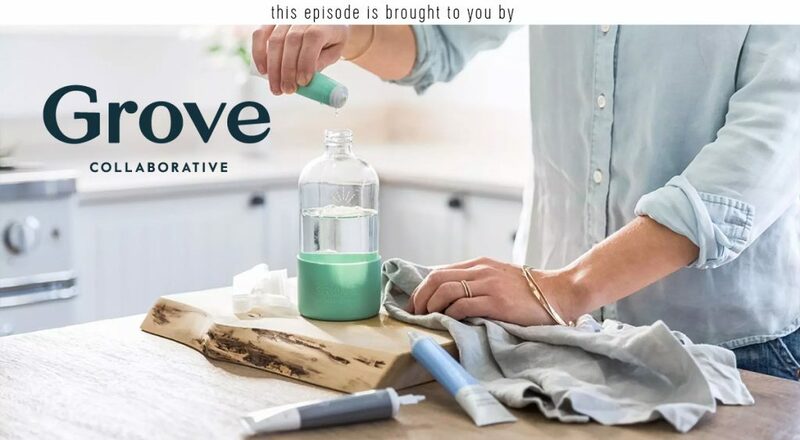 And lastly, a big thank you to Grove Collaborative for sponsoring this episode. Sign up at Grove.co/YHL to receive their FREE gift: a trio of Mrs. Meyers cleaners, a set of walnut scrubber sponges AND a tin cleaning caddy. Yup, all of that’s FREE!